Tristan loves having a bath and loves playing with his bath toys. We don’t have many toys for the bath so far. When Hevea offered us their POND bath toys to review I was excited about Tristan testing them out and having a new toy to make his bath time fun. Founder of Hevea Baby, Terese Hoffeldt believes that natural products, sustainable production and stylish designs are vital. When she had her daughter she wanted a pacifier that fulfilled those demands by being a stylish pacifier made from natural rubber. She had no success in finding a pacifier that met her needs of being 100% naturally rubber, a great design, sustainably produced and packaged in an environmentally friendly way. From this lack of pacifiers that met all of her needs she developed the Hevea pacifier and she aims in making parents and children happy with Hevea products now and in the future. The name ‘Hevea’ derives from the Latin name for the species of trees ‘Hevea Brasiliensis’ which is often called rubber tree. The tree’s natural sap extract is what we know as latex and these trees are the primary source of natural rubber. Hevea POND bath toys are made out of sustainably produced 100% natural rubber latex from Hevea rubber trees. They are free from BPA, Phathalate, PVC and silicone and there are no artificial colours or dyes used with these toys. As they are 100% natural they are completely biodegradable. These Danish designed bath toys are hand crafted in Europe. Each animal is made in a super hygienic one-piece design to prevent any water getting tapped inside causing mold, mildew or grime. The packaging is made from recycled and biodegradable materials with the stylish graphics printed in soy ink. Hevea bath toys offer a toxic and bacteria free bath time. You can be reassured that they are safe as the bath toys meet EU Safety Standards EN71. As they are made from 100% natural rubber they will darken in colour over time. To prolong the lifespan of these bath toys when not in use they should be kept clean, dry and not in a moist environment and kept out of direct sunlight and away from direct heat. Each set comes with 3 soft and squeezable toys; ducky, froggy and fishy. My first impressions were that I liked the packaging; the design is very attractive and distinctive. I like it even better knowing that it is environmentally friendly and it’s the first time I have ever heard of soy ink. The toys are very cute and are very squeezable. They are amazingly well made with such detail for a bath toy; I am very impressed with the designs. I was curious to see if Bug would play with them, as they aren’t bright and colourful I wasn’t sure if he would be attracted to them. You can tell they are natural from just looking at them and even though I wasn’t sure if they would be eye-catching for Bug I am reassured knowing that they are natural and free from chemicals or dyes. Bug loved them straight away!! He ignored his other, colourful toys and instantly grabbed for the Hevea animals. He seemed to love how squeezable and soft they are and they are the perfect size for his little hands to easily grasp them in the water. They have been a big hit every bath time. He loves splashing around catching the different animals and gets great satisfaction from chewing on them. They have a great gentle surface to help soothe his sore and painful gums from teething whilst having fun playing in the bath. As they are 100% natural and free from any nasty ingredients I felt happy and reassured that they are safe for him to put in his mouth and chew on. 99.9% of bath toys have some way for water to remain trapped inside and accumulate mold and grime which not only looks disgusting but is also unhygienic and I definitely don’t want Bug playing with moldy, gross toys! Hevea bath toys have solved this problem by being a one-piece design so not only does Bug love playing with them but I can also feel happy knowing they aren’t going to collect water and get moldy. You can clean them by placing in boiling water for a few minutes or by cleaning with vinegar as suggested on their website. I have been told by Hevea customer services that they can safely be used in chlorine water which is a great bonus as I can take them with us when we go swimming for Bug to have some toys to play with in the swimming pool. I highly recommend Hevea POND bath toys though not vibrant and eye-catching they are soft and tactile to touch and made from a material that babies and little ones instinctively want to play with, squeeze and chew on. They look great in the bath and they bob around the bubbles brilliantly, Bug enjoys chasing them around the bath. They are amazingly designed cute little animals that are perfect creatures for bath time fun. I love that they are made from a natural product which is safe for Bug and that Hevea Baby have amazing values to produce great products that are environmentally friendly and perfect for little ones too. The toys are well made and durable and as they are soft and malleable they are perfect for tiny hands to grasp and squeeze which also helps and encourages a baby’s early developmental skills. Bug approves which speaks volumes about how great these little creatures are! If you are after a bath toy that is bigger, Hevea also make ‘Alfie’ a king sized rubber duck. 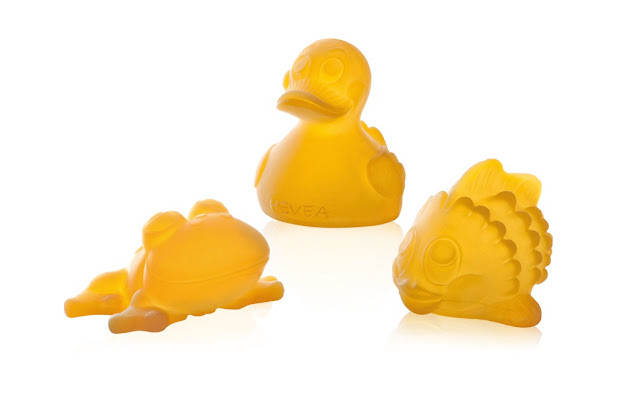 The Hevea POND bath toys can be purchased for around £19.99; prices do vary with different stockists, a list of stockists can be found on their website. Their website also provides information about the other products that they provide. Hevea also have a facebook page and can be found on twitter as @heveababy. Avoid buying toys made from porous materials. Mold can grow on materials that porous and very difficult to clean.